I’m a huge fan of spring fashion; skirts, shorts, sandals, wedges, bright accessories and don’t get me started on the citrus colours. I’m a tad obsessive with colours like yellow, orange, lime & white. Goodbye black, hello COLOUR! Spring is also event season, lots of long lunches, afternoon cocktails and date nights by the ocean. I love it and just can’t get enough! Now like all girls I LOVE my bags and one of my favourite online stores is Bagtrader. 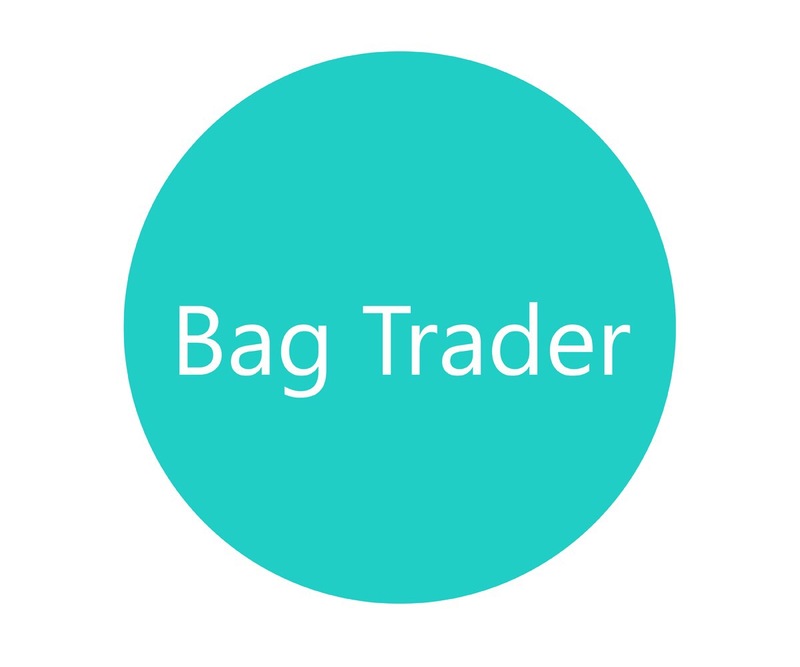 I love Bagtrader because of their unique range and like me they are not afraid of colour. Their website is a beautiful rainbow of bright bold colours that leap off the screen (and into your home) and this spring they have not disappointed! One of my latest obsessions is the ‘Everyday Clutch’ and just like the name suggests, it is ideal for ‘Everyday’ and any event from casual to dressy events. The Everyday Clutch is made of the most delicious soft leather that is just beautiful to hold and the colour range – BOOM – it screams SPRING! 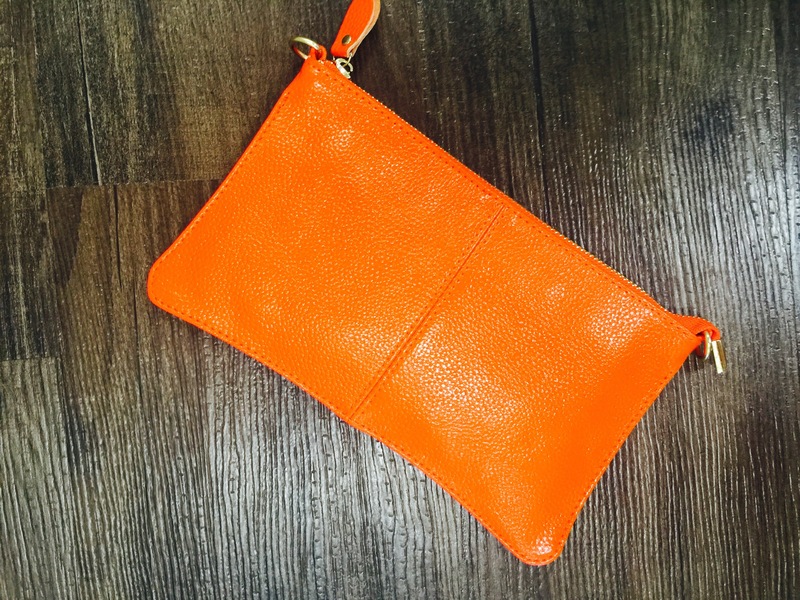 My clutch is in the eye catching orange which has been many a conversation starter with many people asking me where I bought it. 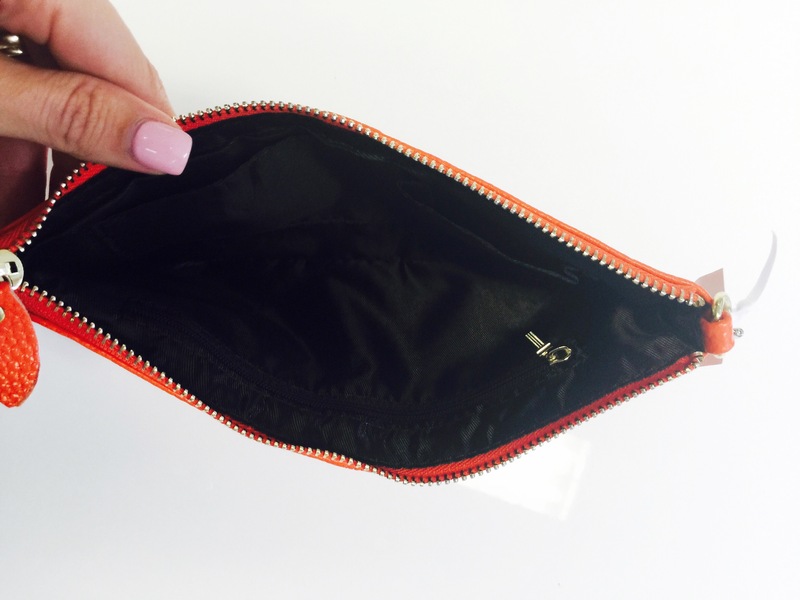 The nice shiny finish gives it a really cool edge plus it’s the perfect size for a phone, cards, lip gloss and has a separate zipped compartment for loose coins. The thing I love about this clutch aside from the beautiful quality is the price. Are you ready? Wait for it …. Only $38! For leather! I have a similar one not mentioning any names (ermmm Mimco…) that I paid over $100 for and it was half the size! So it’s affordable and if you have an addictive personality like moi you can afford to buy all the colours of the rainbow because choosing just one colour is almost impossible. So on that note I’m going to grab my clutch and take her out for a bit of lunch because someone as pretty as her should not be cooped up inside an office all day long, it’s time to show her off! Would you like to add a pop of colour to your spring wardrobe? 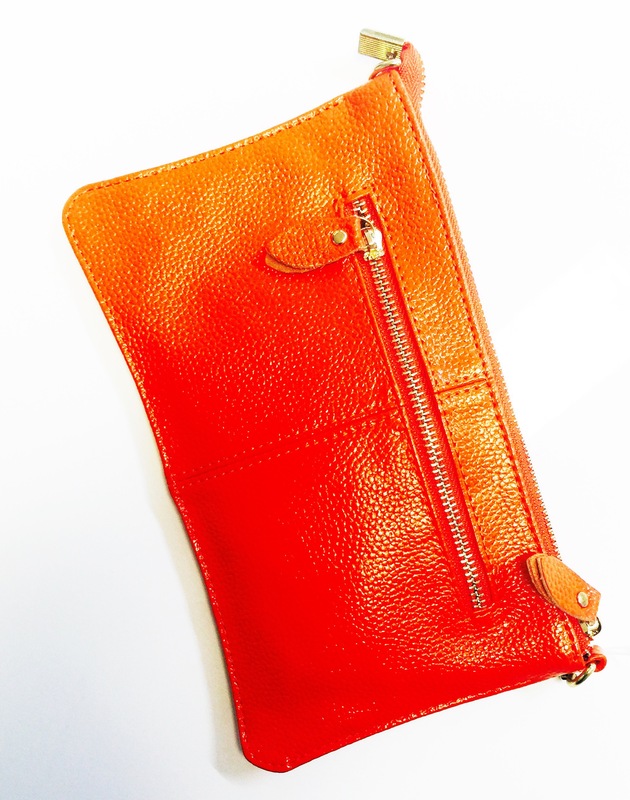 Well I’ve got your back and so has Bagtrader because one lucky reader is going to WIN a gorgeous orange ‘Everyday Clutch’ just like mine – yes we can be twins! So for a chance to WIN simply share with us your Spring Style? Our judges will choose their favourite answer and announce a winner 20th of September at 9pm. Bagtrader offers $10 off any purchase when you join their mailing list (via the pop up box on the home page). Mrs Tink followers get the added bonus of $20 off any purchase total, all you need to do is enter the Coupon Code ‘MRSTINKROCKS’ at checkout to receive this amazing discount (min. order $40 – expires midnight 15/10/15). And the winner of the MUMA Health Tea is…. Mrs Tink gets a run for her money as a new ‘selfie master’ enters the building. My spring style is light and bright colours, flowers in the hair and some beautiful new shoes. I love wearing anything that’s a bit bright and fun or even just your blacks and whites and accessorizing it with bright, fun and gorgeous solid colour bags, shoes and/ or headwear. I try to out-bright the spring flowers. Glorious colours paired with a few metallics. Sometimes I cheat and wear spring flowers in my hair. A circlet of freesias looks and smells fantastic! I as born in Spring! “Spring Chicken” So casually, its my favourite month! My spring style, is a bit here, there and everywhere.. But the one thing that does stand out is all my colours! The flowers outside are blooming, so I try fit right into that! Floral and warm colours are my best! I recently got a new dress, when I say recently I mean 4 Months ago, in summery London. I like to call it my garden party dress, and yes it still has the tags attached because I’ve been waiting for the “perfect” spring day to wear it! 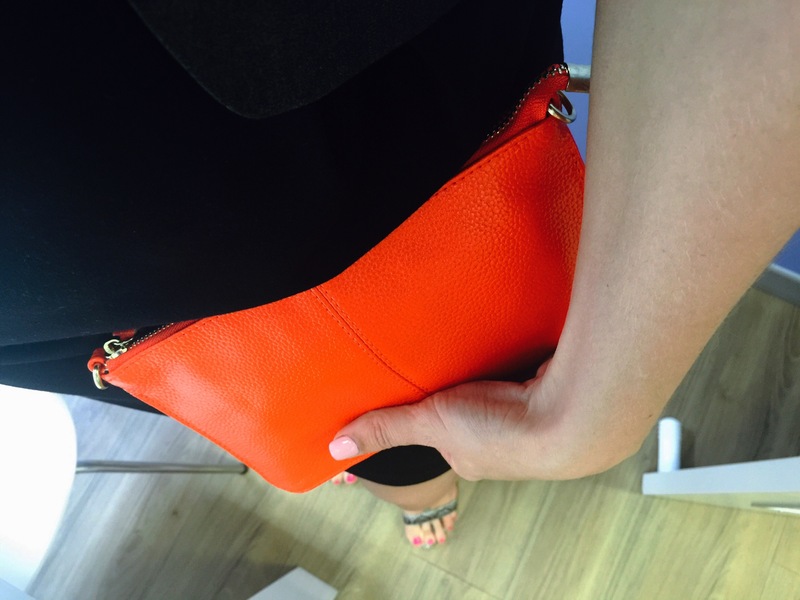 I think this little orange clutch will just make it! l love the bright colors in spring , when spring has sprung l love to go shopping and look at the new seasons colors . l must admit l am a self confessed bag addict and this clutch looks amazing , perfect for the new dress l am eyeing off!! My spring style is bright sunny colours and floral prints as I love that nature is blooming and the weather is warming up. Yay! Lots of denim, oversized bags, large sunglasses, and funky sandals and hats. Simple and classic, but never boring. I feel like my 2015 spring style is very different to previous years. After spending a very dark winter training hard and eating clean, I have lost almost 10kgs … I am feeling fabulous. So far Spring has been filled with flowers, colour, short dresses, smiles and CONFIDENCE! Cheers to the warmer weather! Spring 2015 has allowed me to explore a completely different style. After spending a very dark winter training hard and eating clean, I have lost almost 10kgs. Spring has never felt so good! So far my new Spring style has been filled with bright colours, figure hugging dresses, smiles and CONFIDENCE! Cheers to the warmer weather!